Back in September, we got an awfully big surprise. Around the third week in August, I had started having undeniable pregnancy symptoms. We did some math on our fingers and excitedly planned for a due date of May 6th, which seemed perfect: I’d be on break between teaching semesters (May is my biggest chunk of time off every year), Hubby would be through with an always-grueling tax season. We’d have plenty of time to rearrange our three boys into bunk beds and all that. And we had plenty of time to wait a month before spreading the news to family and friends, so we didn’t tell anyone yet. Still, we both admitted that something felt off. There was something different about this pregnancy, but we couldn’t figure out what it was. Three weeks later, in the middle of catching ourselves up on Downton Abbey, the baby kicked me. I put my hands on my stomach and suddenly couldn’t pay attention to the captivating drama of Mary and Matthew anymore. I froze, waiting for it to happen again, my head spinning to catch up with what this meant. It meant I wasn’t seven weeks along, that was for sure. It definitely meant we weren’t due in May. When the episode ended, I timidly revealed the news to Hubby, and we spent the next hour laughing at the possibility. Could it really be true? Could we have been pregnant since last May and not known it? Two days later, an ultrasound confirmed it: we were over eighteen weeks along! Due February 8th. Everyone’s response to the news? “I didn’t even know you were pregnant!” Well, we said, neither did we! Since that ultrasound September 14th my priorities have swung in a wildly different direction. I abandoned the blog and put all my spare energy into prepping our house and lives for a new baby in less than four months. Today is the first day in those months that I feel suddenly open to blogging, ready to see if I can still write anything after so long out of practice. 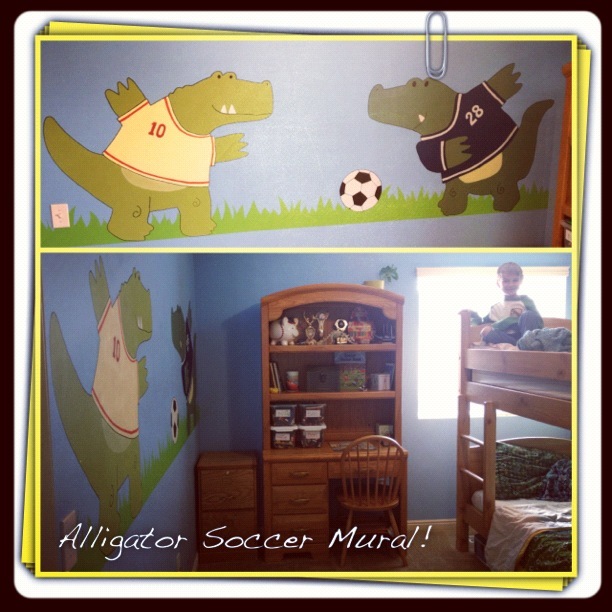 The older boys’ room is finally outfitted with a bunk bed (including a new handmade quilt for my five-year-old who was previously in a toddler bed), a mural to fill the wall space, and painted closet shelves. The other room now holds a toddler bed, a crib, a changing table, a rocking chair and a train table, with just a few things left to arrange on the walls before it will feel complete. 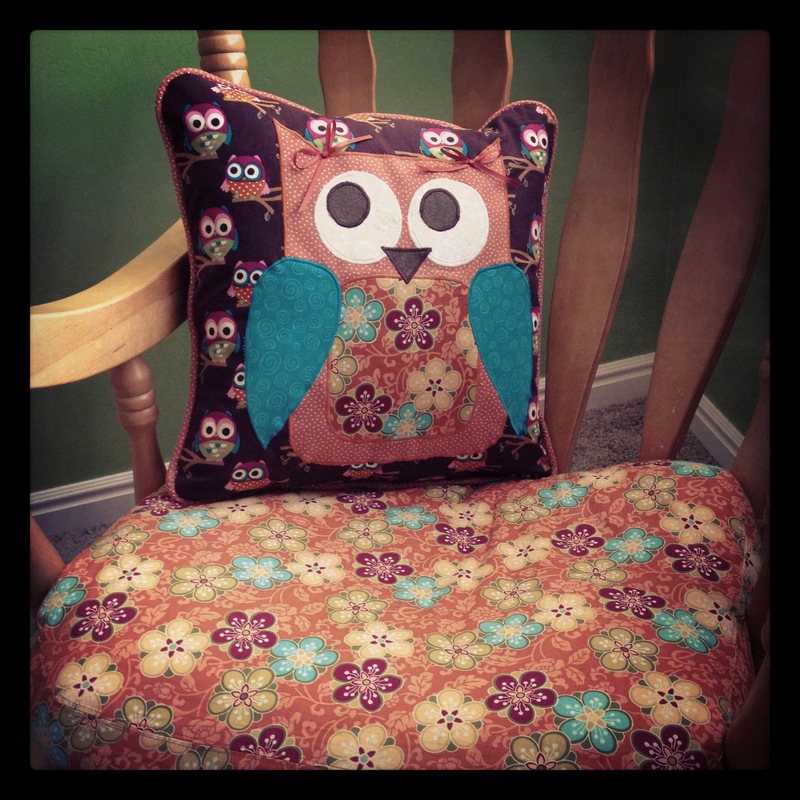 I’ve crocheted a flower blanket, sewed a floral chair pad and girly owl pillow for the rocker, and continued nesting like that to my heart’s content. 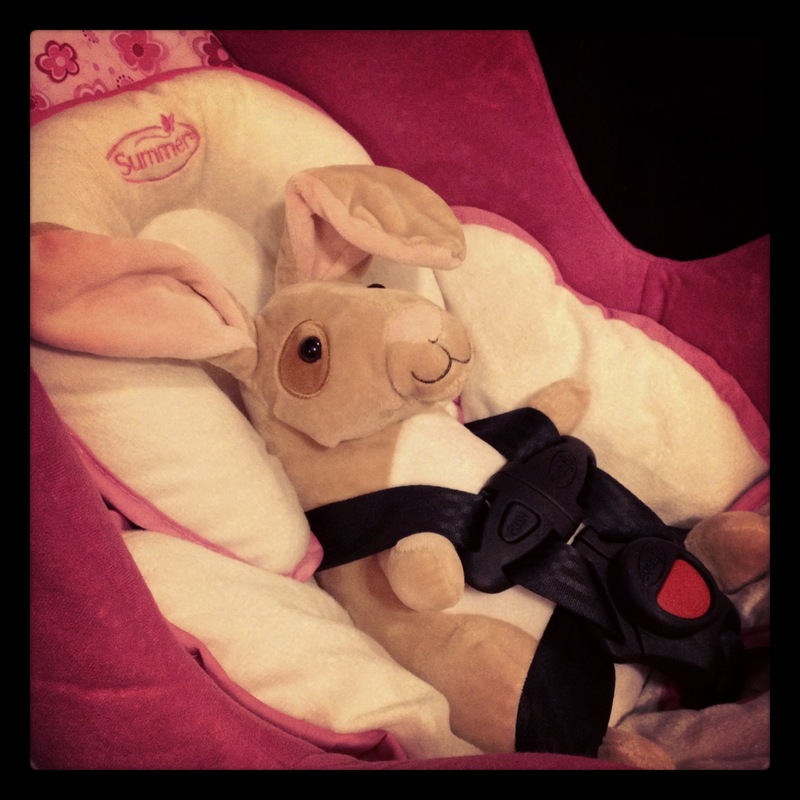 This past weekend her grandma bought us a bright pink car seat and a neighbor loaned us a bassinet. Her closet now has just enough size 0–3 months clothes for us to get by for a little while. I can finally feel ready. Last night, sporting a basketball under my shirt, I walked into a room full of strangers facing me in their desks, probably wary as the first thing they learned about their new college English teacher is that she is nine months pregnant. But once we got going, and they opened right into discussion so easily, I felt the usual thrill of discovering I’ve got a good group of students — knowing we’ll be able to analyze and dig into complexities and have the room hum with enthusiasm because I can tell they’re interested and they care. 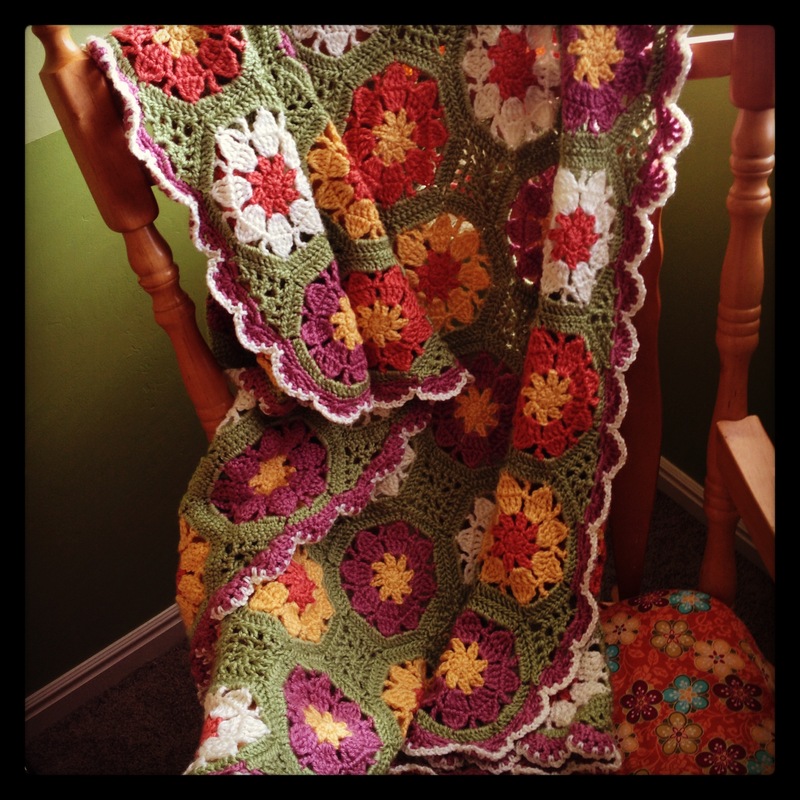 It reminded me how much I love all that, including discussion here on my blog. At the same time, this is my fourth time around having a newborn, and I know my limits. I cut down to just one class this semester so that those 75 minutes twice a week are my only commitment in these next few months besides my baby and three boys. This post isn’t an announcement that I’m back to blogging, just an update to confirm that I’m not. Since my last baby, I’ve learned a lot about shaking off stress and living a peaceful life. That’s the life I want to welcome my daughter into — in just three short weeks! Writing will resume when it feels right. You must go through the motions of being creative. Never stop with your first good idea. Expect the experts to be negative. You do not see things as they are; you see them as you are. Always approach a problem on its own terms. But I’d also like to illustrate. A few weeks ago Hubby and I were talking about my writing, and he mentioned how he feels as though, personality wise, I’m much more analytical than I am creative. Therefore, he said, shouldn’t I pursue analytical writing of some sort (haha, such as these blog posts?) rather than fiction writing? I agreed with him to a point: I am naturally analytical, and creativity is hard work for me, but that doesn’t mean I’m not good at it once I get there. I noted that he hasn’t read my fiction yet and explained to him that though my characters and stories don’t come easily to me at first, I use my analytical skills to bring them to life one draft at a time. The conversation made me realize that I’ve decided to be creative, decided to believe that I can be creative, and even decided to believe that I am good at creativity. I think that’s why I loved the article. I experience those twelve concepts on a regular basis. I have to believe I’m creative; I have to work hard at wrapping my brain around my projects; I have to go through the motions and be open to all kinds of ideas; I have to trust my instincts and pursue the projects and designs I feel inclined toward, trusting that I can achieve the potential I imagine; I have to be willing to think outside the box all the time, questioning “rules” of writing and when to adhere to or break them. What’s been especially phenomenal the past month and a half is experiencing the height of the creative process. I swore to Hubby and Twitter that I would aim for two goals: (a) to write every day, no matter what, and (b) to revise a chapter a week in order to finish this latest draft by April 1. As I’ve done those two things, I’ve been amazed at the creative output I’ve discovered. I’ve been completing each chapter early every week because the ideas have flowed so freely. I’m so excited to write every day that I can hardly wait to put everything else aside (especially children — since I have to wait for the toddler’s afternoon nap) and open my manuscript again. Part of the credit goes to the place I am in the process. Since it’s a fifth draft, where I expect to be ready to submit to agents after this round, the characters and story are all in place and I’m simply monkeying with individual scenes, altering and moving and deleting them to enhance the telling of the story and the showing of the characters. It’s a fun stage, juggling and rearranging pieces and having new epiphanies all the time about how to improve them. But I think most of the credit goes to pushing myself to write every day. I used to let lesson plans and grading papers encroach on my writing time, but now I’ve decided not to. I’m an adjunct teacher, meaning that it’s a side job. 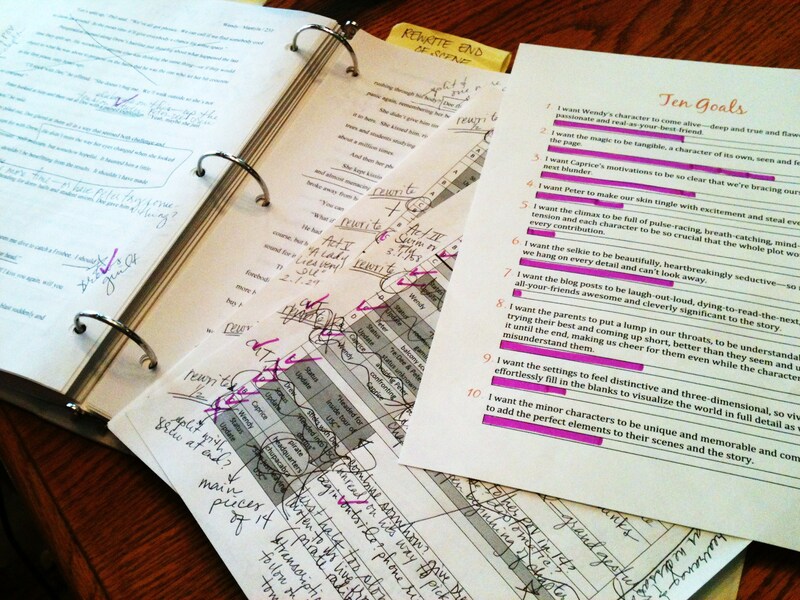 Writing is my main job (besides motherhood), so the writing has to have its regular structured time. The side job has to fit in on the side, where it belongs. So when the toddler naps, I write — no exceptions. And so far I have fit in the planning and grading elsewhere, like when the kids are busy playing with toys. Writing every day keeps the story and characters fresh in my head. I don’t waste time trying to catch myself up and figure out where I left off. 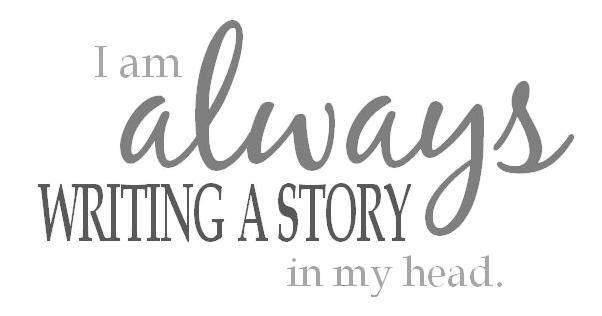 I can dive right back in every day and keep the momentum of the story building as I revise. And my enthusiasm for it grows as well. As it turns out, when I invest myself in the process I am creative! What have your experiences with the creative process been like? What points on that list are particularly meaningful to you? I’d like to dedicate this post to the one who made it possible. Sunday Afternoons, how I’ve missed you! A photo from Old House Online that made me think of you. How great you and I would look together in this setting! In that quirk of Mormondom, the yearly rotating schedule, it felt like ages since I’ve had you to myself. The 1pm church time — lasting until 4pm! — made me rush past you with barely a chance for a wistful glance, as I had a strict appointment with Dinner Prep right afterward (for our exercise routine, set to the rhythm of chopping and sizzling and boiling). But now! Now that it’s our congregation’s turn to conclude at noon, three weeks in a row I’ve had the pleasure of your company again, the gift of your lavish hospitality. You are the sort of friend everyone needs: so generous and undemanding. Last week’s sweater you helped me crochet turned out well! And the book I had today: excellent. I’m indebted to you for the hours to relax with it. How good that felt! In the tumultuous busyness enforced by the totalitarianism of Other Days, there’s rarely a scrap of time for savoring words and ideas. Each is pushed out by the next more pressing one. But you, Sunday Afternoon — you understand that relaxation is an oft-neglected task, a necessary indulgence, a luxury as mandatory as breathing. You, like a shelter, provide the space for reclaiming lost thoughts: searching them out and gathering them up and finding a spot for them and pausing over each one to see how it is doing and what attention it needs. You give me freedom to choose words at my leisure rather than rushing to settle on the first that will do. Other Days may boast of their activity, their capacity, their productivity, their exclusivity, but you deserve praise for your charity. Thank you, kind friend, for being here for me when I need you. It was hard to be without you so long. It’s New Year’s Day 2012, and I’ve been stuck dealing with a 2011 mess. It might be hard to tell what exactly is going on thanks to that tangled mass of yarn, but the tangled mass is what’s going on. Or what’s going out. I volunteered to crochet some hats for charity, and as I was working on the blue-and-brown one a few weeks ago, my toddler and preschooler had a little too much fun with the skein of yarn. I got to a point where I couldn’t even use the yarn anymore until I stopped to unravel it. And the unravelling is taking forever. 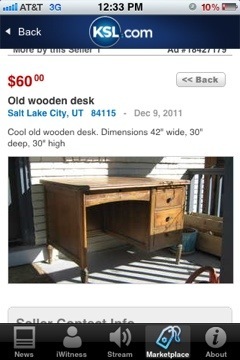 Similarly, on Friday I bought myself a desk out of the classifieds. 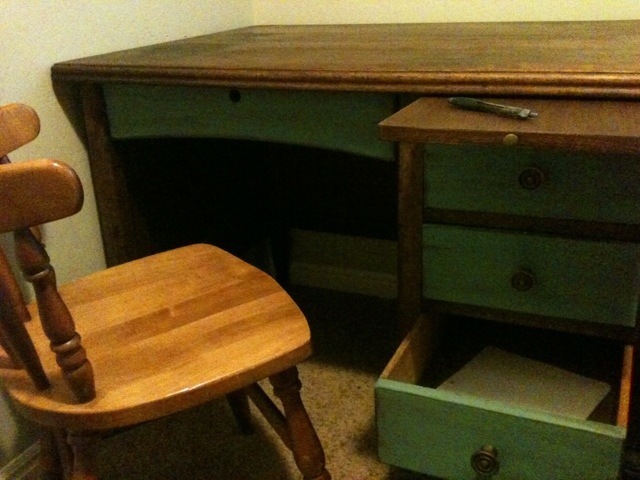 It called to me the second I viewed it, after paging through hundreds of other desks, this one full of character and exactly the size and shape (and price range) I need to move my writing station off our kitchen table and into our basement. But it wasn’t in much better shape than my skein of yarn. I spent all afternoon Friday sanding and staining until my right arm was so dead I couldn’t use it to even wipe my nose that night. 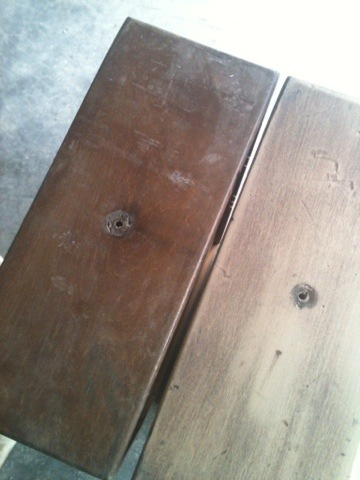 As I sanded, I thought about the undoing of things. I thought about how much I wanted to jump to the polishing stage, how ridiculous it felt to be taking the desk apart before I could put it together better than it was. In many ways the original desk seemed closer to being done than the sanded desk I spent hours on, as you can see in the picture of the not-yet-sanded drawer next to the sanded one. And I thought how it feels that way with writing too. Sometimes it feels like I’m going backwards, undoing things in my story by deleting scenes and rewriting sentences. It’s hard to feel like that’s actually progress when I want to be at the polished stage. I just have to remind myself that unraveling the story is essential. I have to sand it down until I’ve got everything in place, every piece ready to proceed. Sometimes the undoing of things is the first step toward creating something better. 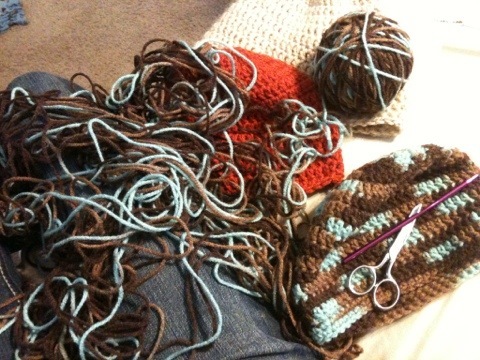 Soon I’ll have a ball of untangled yarn ready to become another hat. And as of yesterday I have a polished desk ready to hold a laptop, a printer, a manuscript binder, pens and scratch paper and all the other essentials, so that I can start 2012 off right, ready to be the year that I send off a polished novel to be published. The desk will still be the site of more undoing as I cut more scenes and trim more lines. But it’s all in the name of progress. Sometimes undoing is what has to be done.